The past couple of months, I’ve taken a step back, and you know what? It’s been nice. I’ve concentrated on the job that actually pays my bills, to good effect. I’ve taken up meditation and committed to my yoga practice. I’ve witnessed a flat-out miracle with my cat. Probably that was the biggest reason for the change – in late March, the vet thought Zoe was saying good-bye to us. My beloved cat was undergoing chemotherapy and losing weight consistently. We made the decision to stop chemo, and I prepared myself for the worst. However, she never stopped eating and seemed to pick up some energy after the treatments stopped. Eventually I weighed her and found out she had put back about half a pound. The vet, completely puzzled, said perhaps she’d been too aggressive with the chemo and it was actually making her sicker than the cancer itself. Let her be for a while and let’s see what happens, she said. That was four months ago, and Zoe is still tossing her catitude about with abandon. She’s still too thin, but has kept on the weight she re-gained. How long will this last? I don’t know, and I’ve trying my best not to concern myself with it. She’s here now. I’ll enjoy the time I get. Very likely, I would just continue on with this new level of detached zen if it weren’t for one thing – the Alive & Running 5K, to be held on September 30. This is the cause most dear to my heart. I’ve survived bouts of severe depression. I arrange my life – how much exercise I get, how much sleep I get, the people with whom I surround myself – around what will maintain my mental health and positivity. It’s the equivalent of a diabetic taking their insulin, and it works. But I’m not sure I’d be around to keep up these day-to-day precautions if it weren’t for competent and compassionate counselors that have helped me through the harder times. If I hadn’t had a supportive family who got me to counseling in the first place, so I could see that it helped, that I didn’t have to muscle through depression on my own. 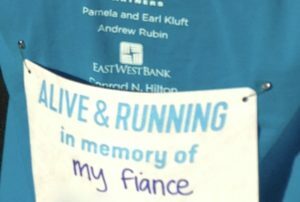 Seen at last year’s 5K, one of many people lost to suicide. Maybe this is the next step in my personal evolution. Learning to see social media as the tool that it is, something that can be wielded for good or ill, just like a hammer or a wrench. Facebook, too, can bludgeon or build, depending on how it is used. I shall endeavor to build. I welcome your company on the journey. Let’s evolve together. Kimberly welcomes your company at the Alive & Running 5K, too. Please click on the link and learn more about this event that brings hope to world in desperate need of it. Welcome back to Facebook. I’ve missed you. I am glad you are back … navigating the wilds of Facebook is a challenge and one that I’ve been lost in a few times! (Note to self: when all my emojis are sad faces, time for a break.) Anyway, thank you for your words, your work and your incredible heart. I totally relate to this message, cat-wise, yoga-wise and drug-wise. I am 91, and Solo’s grandmother, and have become a gutsy home-owner after leaving an assisted living center to share my talents with sane people. Concur on all above about glad to see you back… just need to note, Betsy is my MOTHER, not grandmother. I definitely need sponsors on this journey, and several of you have already stepped up. Thank you all so much! 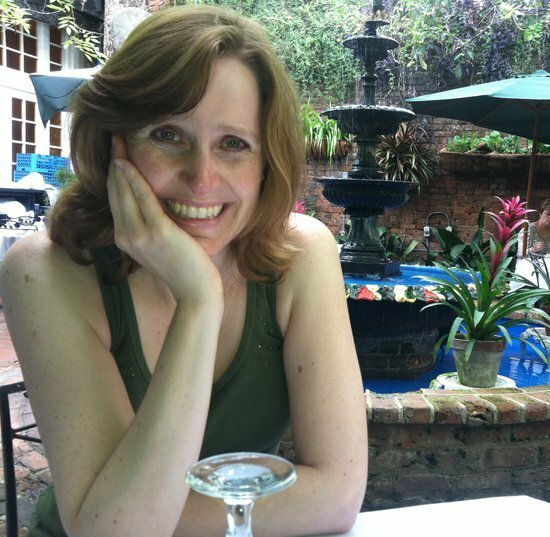 Betsy Goodspeed, I am delighted to have you for a reader! Can’t wait to check out your blog! Hi, sweetie! I’ve missed you! And, UH, FB! It’s ALL about politics and showing-off…you’re so right. Write. LOL. Anyway, I can certainly relate to your cause. God bless you and yours. 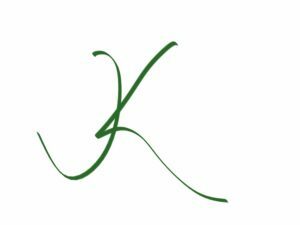 Welcome back to the writer, missed all of the fun-loving, witty stories that take us away for the ridiculousness of our lives. Good luck to the best sponsor year ever!!! Tag: Alive & Running, depression, Didi Hirsch, health, mental health, suicide walk. Good to have you back!!! Maybe you’ll inspire me to start up again!